So a few posts ago, I shared the boys laying the floors upstairs. Many of you were stressing out about the lack of railings...scaredy cats! We are now much safer, and pretty to look at too. Since the basement is far from finished and full of stuff we have yet to unpack, let's head upstairs. 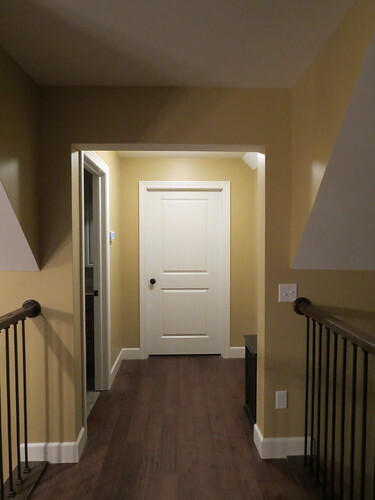 We have two bedrooms and a bathroom separated by a sort of cat walk type hallway above our great room. We also have a little loft area in between the bedrooms. 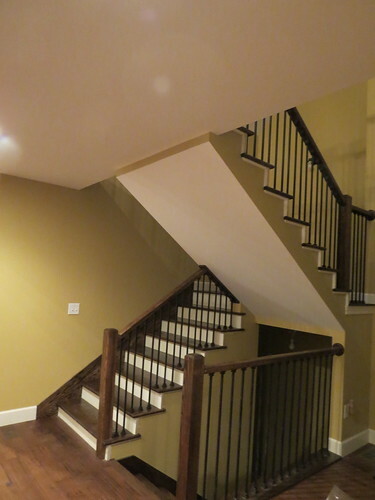 We stained the stair treads, newel posts, and the railings ourselves. The color we used was Jacobean from Minwax. We used one coat of stain and three coats of sealer. I can not imagine doing any more coats---all that sanding and staining! And get this... our builder supply store didn't measure right the first time, so we have 7 stair treads in our basement that are too small...and all stained and varnished! But that is another story, for another day. Turn right at the top of the steps and you have the guest area (futureroomforsupercutekidssomeday) Straight ahead is our guest bedroom or currently my dad's room since he stays with us a few days every week while he works on the exterior stone. To the left is our full guest bath. To the left you see our entry foyer over the railing and the other guest room behind that door. We added a little loft area last minute when they told us that was just going to be wasted space behind a wall. We are happy we did, it will be a nice place for a desk or a little reading nook. We wanted sometime that wouldn't break the bank, but still had the style we were going for in the house. It actually looks a little dinky in this photo for some reason, but it's pretty large in real life, but it does fit in well with the space. Iron balusters and jacobean stained newel posts and treads. The iron ballusters. This is second behind my fireplace as my favorite item in the house....We couldn't decide on the basket design that attaches on the iron balusters so we said NEVERMIND in the midst of frustration to make a choice. But I am glad we left them as is. Some of the designs are just too fancy for me and I like the look we ended up with. Watching Adam build a fire. Now everyone can relax. 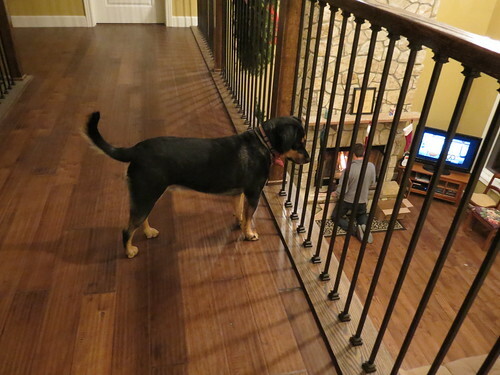 The dog will not fall off the catwalk...getting his head stuck in between those iron balusters? Maybe. 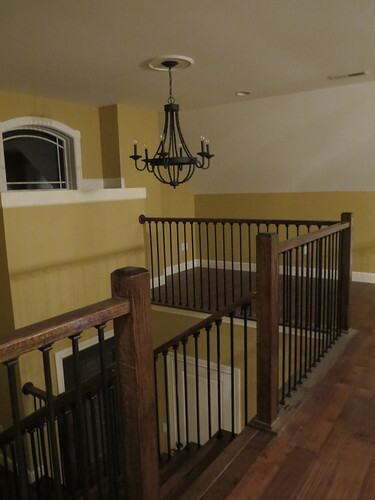 The balusters are beautiful! I think they are the only iron ones I have ever seen that I actually like. Excellent choice! And I love all the little nooks and crannies you've got... great places for odd little pieces of furniture and whatnot. thanks! I knew I wanted iron but I couldn't decide on a style, so we went with plain...and we are happy we did! Your house is UNREAL. So beautiful and spacious, but totally looks like it's cozy! So beautiful! Love the floors, the wall color, the fireplace.. all of it! thanks amy, it is coming together nicely, finally! Gorgeous! I love your floors! I'm so jealous of your wood floors in the hallway. I keep trying to talk Nate into ripping up our hall carpet. I am losing. Love the wall color as well!! we were wishing it was carpet when we were installing them but we are happy with how they turned out! 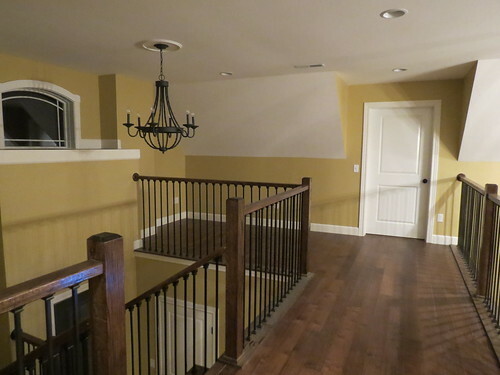 I love the whole look of the upstairs hall! The floors are gorgeous... oh my gosh. I've never seen railings like yours either, and they're awesome! 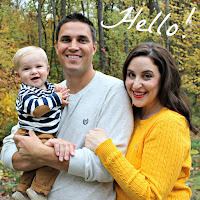 You guys have really gone an amazing job with your home. Seriously. So gorgeous. the railings are amazing, they are exactly the look I am hoping to replace our hideous ones with someday! i love the stain you chose too, it's gorgeous! thanks they really pulled the house together with the look we were going for! You did a great job on the stair railings. It must be a real feeling of accomplishment to build your own home. 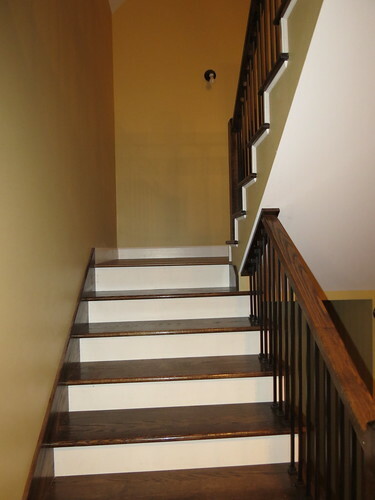 I always feel anxious when there are no railings on a staircase.